Post-war Japan makes a perfect historical background for Kurosawa’s in-depth analysis of the human sense of guilt. 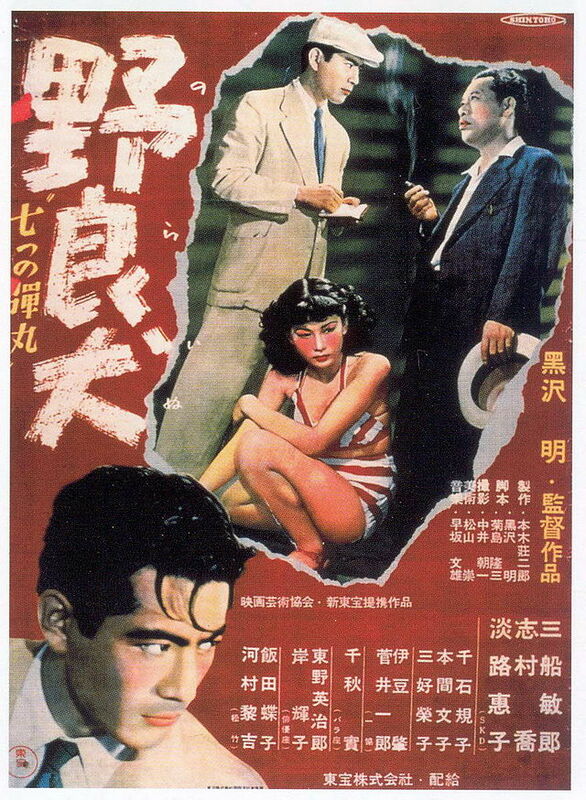 The director develops the Japanese nuances of the concept of responsibility for one’s actions or one’s omissions in the depiction of young and inexperienced policeman Murakami, played by Toshiro Mifune (who later will be so well-known abroad for his role in other Kurosawa’s movies such as The seven samurais or Rashomon). He is stolen his Colt pistol in the train by a pickpocket. Later, assaults and murders start to take place using that gun. Murakami’s descend to the low-life sceneries of Tokyo’s slums is masterfully extended for voiceless minutes in which the desperate character’s eyes or shots of his legs are superimposed to scenes of endless alleys crowded with people buying in the black market. After his investigation brings some results, he is assigned a veteran policeman as a partner to help him with the case, Satô San, who explains that ‘an abandoned dog will necessarily become a stray dog’ but that evil is out there and their duty is to catch criminals without questioning their reasons in order to protect society. 野良犬 Nora Inu is not just an action movie or a detective story but also a reflection about how WWII left Japan economically devastated; and a whole generation of young war veterans suffered from psychological problems and inadaptation. Some of them, like Murakami, were able to straighten out their lives; others, like the stray dog Yusa, lost control and fell into the crime world. The more the young detective finds out about the young criminal’s life, the more he acknowledge the similarities between the latter and himself, emerging then the figure of the double in the movie, that will lead to an electrifying and moving climax.